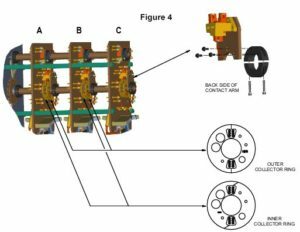 In this installment, we will discuss upgrades for the selector switch assembly of your Westinghouse UTT Series load tap changer (LTC). These upgrades address areas of the selector switch that are prone to failure due to overheating and carbon buildup and are applicable to the UTT, UTT-A and UTT-A70 models. Each phase of a 3-phase LTC contains a selector switch. Below are 3-D models of individual phase panels for each of the different UTT Series LTC models. Red arrows indicate areas where overheating and coking typically occur. These arrows also help visually identify areas where there are differences in the designs of the individual models. 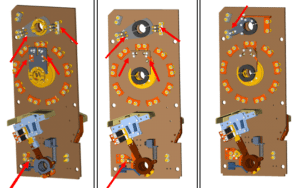 Figures 1 and 2 below depict the flip side of the moving contact arm assembly in which the contacts are clearly visible. Arrows indicate areas of the moving contact arm assembly where overheating and carbon buildup are most likely to occur. Figure 1 depicts the UTT model and Figure 2 depicts the UTT-A/UTT-A70 models. By upgrading the moving contact assembly of the UTT, UTT-A, UTT-A70 to the UTT-B design, the risk of overheating and carbon buildup in the contact areas is fundamentally reduced. Figure 3 below depicts the contact arm assembly of a UTT-B with the contacts exposed. The upgrade to the UTT-B design reduces the number of contact fingers from four (4) to two (2) and the number of non-wiping fingers from four (4) to zero (0). In addition to the upgraded contact configuration, the collector rings on the UTT-B design are offered in an improved “split” design for phases A and B. Figure 4 below indicates the position of the collector rings. The split design allows for worn collector rings on phases A and B to be replaced in the field without untanking the LTC. Our 30 year history of providing replacement parts for the majority of OEM LTCs has allowed us to develop the capability to confidently engineer, manufacture and support a myriad of design-enhanced replacement parts. You can be confident that the SPX Transformer Solutions’ version of the UTT-B style selector switch components will match the performance of the OEM part at a fraction of the cost. 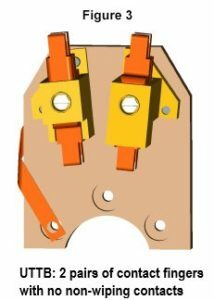 Similar upgrades are available for the UTT, UTT-A and UTT-A70 transfer switches. These other upgrades will be covered in detail in the third installment of this three-part Tech Tip series. To learn more about all upgrades available for the UTT Series LTC contact a member of our sales team at 1-800-338-5526. Also, don’t forget about our library of easy-to-navigate, 3D catalogs designed to help you quickly identify and locate hard-to-find components for LTCs and oil circuit breakers, while also including one for the SPX Transformer Solutions’ line of Transformer Health Products®.